Objectives: Hepatitis C virus recurrence after trans-plant is universal. Histologic recurrence is observed in > 50% hepatitis C virus-infected grafts within the first year. The primary aim of our study was to evaluate factors responsible for hepatocellular carcinoma recurrence and mortality including histologic markers. Materials and Methods: All patients who had undergone transplant for hepatocellular carcinoma associated with hepatitis C virus from 2002 to 2012 were evaluated retrospectively. Results: There were 109 patients with hepatocellular carcinoma associated with hepatitis C virus that underwent living-donor liver transplant from July 2002 to June 2012. On univariate analysis, preo-perative Model for End-Stage Liver Disease Score (P = .026), α-fetoprotein level (P = .020), rapid fibrosis (P = .008), and Hepatitis Activity Index ≥ 6 (P = .008) were associated with recurrence. On multivariate Cox proportional hazards regression model, Model for End-Stage Liver Disease score (P < .0001) and rapid fibrosis (P = .015) independently predicted hepato-cellular carcinoma recurrence. Conclusions: Hepatitis C virus recurrence on biopsy is a poor prognostic indicator and is associated with a higher risk of hepatocellular carcinoma recurrence after liver transplant. Rapid fibrosis after liver transplant independently predicts hepatocellular carcinoma recurrence. Recurrence of HCV after liver transplant is almost universal and results in progressive fibrosis, cirrhosis, graft loss, retransplant, and mortality.3 Recurrence of HCV after liver transplant is 1 of the most important issues. The course of graft hepatitis usually is more progressive than that of primary HCV infection.4-7 Histologic recurrence is observed in > 50% HCV-infected grafts within the first year and is responsible for allograft failure in 10% recipients within 5 years of transplant.8 A few studies have evaluated the effect of posttransplant histologic recurrence of HCV on HCC recurrence and survival rates. Chronic active hepatitis is 1 of the important factors in carcinogenesis after surgery.9,10 Many studies analyzed prognostic factors such as tumor number, tumor size, and histologic patterns of the tumor such as vascular invasion and tumor grade. However, few studies have analyzed the effects of posttransplant HCV recurrence on HCC recurrence and overall survival after liver transplant. The primary purpose of this study was to evaluate factors associated with HCC recurrence, including severity of HCV recurrence. 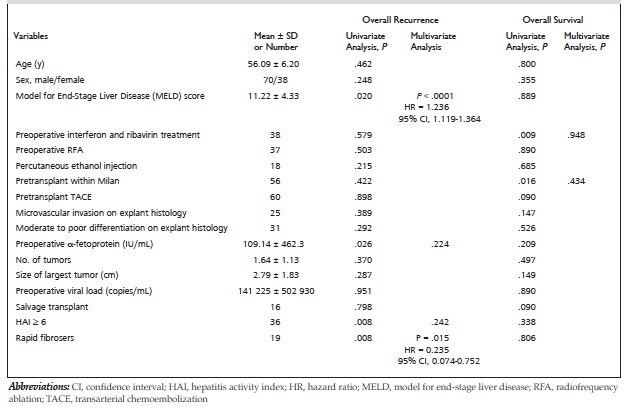 We used posttransplant Hepatitis Activity Index (HAI) and fibrosis rate as histologic markers of HCV recurrence. We also evaluated the effects of HCV recurrence on overall survival rates. All patients who underwent living-donor liver transplant at Kaohsiung Chang Gung Memorial Hospital, Taiwan for HCV-related HCC from July 2002 to June 2012 were analyzed retrospectively. Rapid fibrosers were defined as patients who developed grade 2 or more Ishak grade fibrosis within 1 year after liver transplant.6 The HAI according to the Ishak score also was noted. We defined posttransplant Ishak score ≥ 6 as significant for HCV recurrence.11 All procedures followed were in accordance with the ethical standards of the responsible committee on human experimentation (institutional and national) and the Helsinki Declaration of 1975, as revised in 2008.4 Informed consent was obtained from all patients included in the study. We followed patients who had HCC with ultrasonog-raphy and computed tomography scanning every 3 months for the first year, every 6 months for the second year, and yearly after the second year. Data analysis was performed with statistical software (IBM SPSS Statistics for Windows, Version 21.0, IBM Corp., Armonk, NY, USA). Categorical variables were analyzed with chi-square test and Fisher t test. Continuous variables were analyzed with Mann-Whitney test. Survival analysis was done with Kaplan-Meier method and log-rank test. Multivariate analysis was done with multivariate Cox proportional hazards regression model. Statistical significance was defined by P ≤ .05. There were 109 patients with HCC associated with HCV who underwent living-donor liver transplant from July 2002 to June 2012. Median follow-up was 31 months. Patient characteristics and univariate and multivariate analysis for overall recurrence and survival were shown in Table 1. In 14 patients who had HCC recurrence, 4 patients had intrahepatic and 10 patients had metastatic recurrence. There were 19 patients who had fibrosis grade > 2 at the end of 1 year and were defined as rapid fibrosers. There were 36 patients who had HAI ≥ 6 at the end of 1 year and were defined as having significant histologic recurrence. Rapid fibrosis was significantly associated with HCC recurrence (P = .008; odds ratio, 0.326; 95% confidence interval, 0.148-0.717). There were 36 patients who developed HAI score ≥ 6 (significant histologic recurrence) at the end of 1 year. There were 9 of 14 patients who had recurrence and developed HAI ≥ 6 at the end of 1 year (P = .008; odds ratio 4.467; 95% confidence interval, 1.371-14.551). In 82 patients, data could be found regarding postoperative interferon therapy. There were 16 pati-ents who received posttransplant interferon therapy. Kaplan-Meier method with log-rank test showed that rapid fibrosers had significant low recurrence-free survival. The 1-, 3-, and 5-year recurrence-free survival values in rapid fibrosers were 89%, 49%, and 49% and patients who were not rapid fibrosers were 99%, 91%, and 84% (P = .001) (Figure 1). 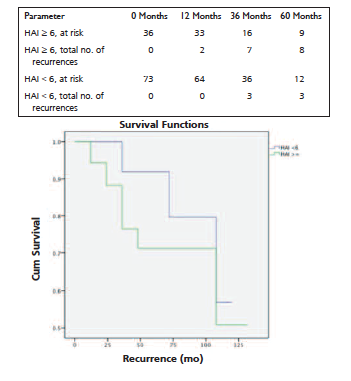 The 1-, 3-, and 5-year survival rates in patients with significant histologic recurrence (HAI ≥ 6) were 88%, 71%, and 71%, significantly lower than patients without significant histologic recurrence (100%, 92%, and 80%; P = .011) (Figure 2). On univariate analysis, preoperative Model for End-Stage Liver Disease (MELD) score (P = .026), α-fetoprotein levels (P = .02), rapid fibrosers (P = .008), and HAI ≥ 6 (P = .008) were associated with recurrence (Table 1 and Figure 1 and 2). However, on multivariate Cox regression analysis, MELD score (P < .0001; hazard ratio = 1.240; 95% confidence interval, 1.118-1.374) and rapid fibrosis (P = .04; hazard ratio = 0.210; 95% confidence interval, 0.044-1.008) independently predicted HCC recurrence. In addition, there was suspected colinearity between HAI ≥ 6 and rapid fibrosis (both histologic parameters of chronic hepatitis), and multivariate Cox regression analysis was performed separately with HAI, rapid fibrosis group, and other factors. On separate analysis, rapid fibrosis (P = .015; hazard ratio = 0.235; 95% confidence interval, 0.074-0.752), and MELD score (P < .0001; hazard ratio = 1.236; 95% confidence interval, 1.119-1.364) independently predicted HCC recurrence, but HAI ≥ 6 was not statistically significant (Table 1). 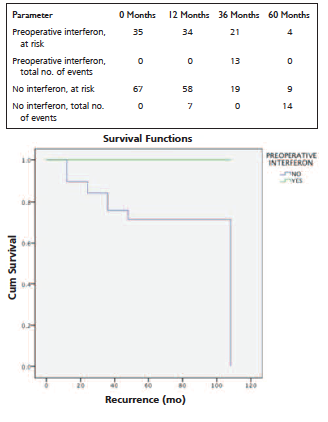 On univariate analysis, preoperative (P = .009) and postoperative (P = .043) interferon therapy were associated with significantly better survival rates (Figure 3 and 4), and tumor beyond Milan criteria had the worst survival (P = .016). On multivariate Cox regression analysis, no factor independently predicted overall survival. Microvascular invasion and high histologic tumor grade were not associated with recurrence or survival in our study (Table 1). However, the rate of fibrosis progression in HCV-infected transplant recipients is variable. Although 30% patients evolve rapidly to marked fibrosis, some patients have slowly progressive disease. 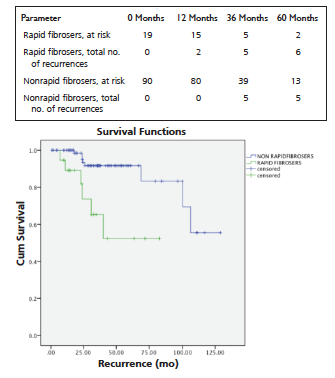 Zimmer-mann and associates suggested that advanced fibrosis scores at 1 year posttransplant and nonres-ponse to interferon were associated with poor patient and graft survival.14 However, there are not many studies showing the effects of rapid fibrosis and histologic HCV recurrence on HCC recurrence post-transplant. Ueno and coworkers suggested that HAI > 6-9 significantly predicted intrahepatic recurrence after HCC resection.15 Zendejas-Ruiz and associates, in their study of 53 patients, showed that HAI > 4 at 4 months was significantly associated with HCC recurrence, but they did not study the effects of rate of fibrosis on HCC recurrence.16 Kubo and associates suggested that HAI > 4 was significantly associated with HCC recurrence after resection.2 In our study, rapid fibrosis independently predicted HCC recur-rence in multivariate analysis. The HAI ≥ 6 was associated with HCC recurrence in univariate analysis but it was not statistically significant in multivariate analysis. 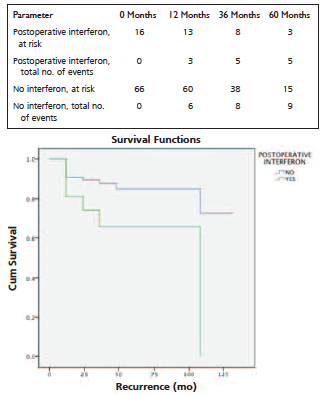 In our study, postoperative interferon therapy did not show any association with recurrence, but patients who received postoperative interferon therapy had significantly better survival in univariate analysis. Kohli and associates showed that postoperative interferon reduces the risk of recurrence, and their findings also suggested that treating HCV recurrence may have a protective effect on HCC recurrence.17 Yoshida and associates, in their multicenter study of 2890 patients, showed that fibrosis stage 2 or greater has significantly greater association with HCC incidence than stage 0-1.18 The findings of Yoshida and associates validate our findings that patients who develop significant fibrosis within 1 year after transplant have a high risk of HCC recurrence. In our study, HAI score and fibrosis did not show any association with overall mortality. Patients beyond Milan criteria and patients who could not be treated with either preoperative or postoperative interferon therapy were associated with lowest overall survival. This suggests that timely interferon therapy, when possible in patients who have HCC with HCV, may help in treating HCV recurrence and may prevent HCC recurrence. We also suggest that studies are required regarding the effects of new anti-HCV treatments on posttransplant fibrosis progression and preventing HCC recurrence. There are certain limitations of our study, because it was a retrospective study, and limitations associated with retrospective studies also can be found here. With a single center study, it was not possible to evaluate larger numbers of patients, and the possibility of type β error is high. In conclusion, HCV recurrence on biopsy (HAI and fibrosis stage) is a poor prognostic factor and associated with higher risk of HCC recurrence after liver transplant. Rapid fibrosis after liver transplant independently predicts HCC recurrence. However randomized control trials are needed to validate these findings. Verna EC, Brown RS Jr. Hepatitis C and liver transplantation: enhancing outcomes and should patients be retransplanted. Clin Liver Dis. 2008;12(3):637-659. Kubo S, Hirohashi K, Tanaka H, et al. Risk factors for recurrence after resection of hepatitis C virus-related hepatocellular carcinoma. World J Surg. 2000;24(12):1559-1565. Cross TJ, Calvaruso V, Foxton MR, et al. A simple, noninvasive test for the diagnosis of liver fibrosis in patients with hepatitis C recurrence after liver transplantation. J Viral Hepat. 2010;17(9):640-649. Neumann UP, Berg T, Bahra M, et al. Long-term outcome of liver transplants for chronic hepatitis C: a 10-year follow-up. Transplantation. 2004;77(2):226-231. Berenguer M. Recurrent allograft disease: viral hepatitis. Acta Gastroenterol Belg. 2005;68(3):337-346. Berenguer M, Prieto M, Palau A, et al. Severe recurrent hepatitis C after liver retransplantation for hepatitis C virus-related graft cirrhosis. Liver Transpl. 2003;9(3):228-235. Prieto M, Berenguer M, Rimola A, et al. Liver transplantation in hepatitis C. A Spanish multi-centre experience. Eur J Gastroenterol Hepatol. 1998;10(9):771-776. Shirabe K, Takenaka K, Taketomi A, et al. Postoperative hepatitis status as a significant risk factor for recurrence in cirrhotic patients with small hepatocellular carcinoma. Cancer. 1996;77(6):1050-1055. Ko S, Nakajima Y, Kanehiro H, et al. Significant influence of accompanying chronic hepatitis status on recurrence of hepatocellular carcinoma after hepatectomy. Result of multivariate analysis. Ann Surg. 1996;224(5):591-595. Ishak K, Baptista A, Bianchi L, et al. Histological grading and staging of chronic hepatitis. J Hepatol. 1995;22(6):696-699. Burra P. Hepatitis C. Semin Liver Dis. 2009;29(1):53-65. Zimmermann T, Otto C, Hoppe-Lotichius M, et al. Risk factors in patients with rapid recurrent hepatitis C virus-related cirrhosis within 1 year after liver transplantation. Transplant Proc. 2009;41(6):2549-2556. Ueno S, Tanabe G, Yoshida A, Yoshidome S, Takao S, Aikou T. Postoperative prediction of and strategy for metastatic recurrent hepatocellular carcinoma according to histologic activity of hepatitis. Cancer. 1999;86(2):248-254. Zendejas-Ruiz I, Hemming AW, Chen C, Schwartz JJ, Sorensen JB, Kim RD. Recurrent hepatocellular carcinoma in liver transplant recipients with hepatitis C. J Gastrointest Cancer. 2012;43(2):229-235. Kohli V, Singhal A, Elliott L, Jalil S. Antiviral therapy for recurrent hepatitis C reduces recurrence of hepatocellular carcinoma following liver transplantation. Transpl Int. 2012;25(2):192-200. Yoshida H, Shiratori Y, Moriyama M, et al. Interferon therapy reduces the risk for hepatocellular carcinoma: national surveillance program of cirrhotic and noncirrhotic patients with chronic hepatitis C in Japan. IHIT Study Group. Inhibition of Hepatocarcinogenesis by Interferon Therapy. Ann Intern Med. 1999;131(3):174-181.